Description | Example | Discussion | So what? 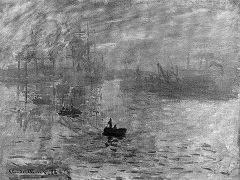 Tone contrast is the perceptual difference between two monochrome hues. The highest contrast is between black and white. In between are shades o of gray. When black is placed next to white, they are clearly different. You can see which is black and which is white. When two grays are placed next to one another, it can be far more difficult to see the difference. Tones can also be seen in colors, for example in the range from a dark red to a bright red. In the monochrome spectrum from black to white, no edge can be seen even though contrast can be seen between separated areas. In the example below, a clear and strong contrast can be seen in the black/white boxes. There is far less contrast between the gray boxes and, even though the boundary can clearly be seen, it is far less distinct than the high-contrast black/white version. Tones are also seen in hues, such as the clear contrast between the two reds below and the lower contrast between the two greens. Tone contrast is different to hue contrast, where different colors stand out more or less when placed next to one another. This is caused by the structure of the eye (and the consequent interpretation by the brain), where the black and white amplitude of luminosity is detected separately from the frequency of hue. In photographic processing, it is typical to edit for tones first, seeking to increase tonal contrast so there is a balance of darks and lights through the picture. This usually results in the image being more pleasing. Sometimes a low range of tones is used for a deliberate effect. When they are mostly light, it is called 'high key', and when they are mostly dark, it is called 'low key'. When the range of tones are mostly middle grays, the result can be rather dull. There is an effect in images where two different hues of the same luminosity placed next to one another cause some confusion to the eye, as it sees hue contrast but not luminosity contrast. The result can be that the image seems to somehow shimmer. 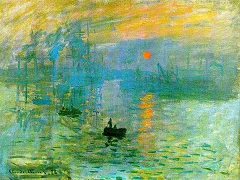 The artist Monet used this effect in paintings such as his 'Sunset in Venice' painting, where the sun and sky have similar luminance. Notice below how the sun in the first image disappears when this is desaturated (hues removed, leaving only tones) in the second image. Note also in the picture how the dark boat stands out. This is because much of the rest of the image is in mid-tones, making this one dark object an immediate focus of attention. This principle applies generally, that if there is mostly X, then Y contrasts with all that X and so Y is more easily noticed. Tone contrast is similar yet different to hue contrast. Tone contrast is about how dark or light a point is in comparison to another point (amplitude difference). Hue contrast is about how different the hues of two points are (frequency difference). Notice the effect of tones and use them deliberately in images. Make things pleasing with a wide range of contrast or high key/low key constraint. Use tone to make things stand out and match other items.